More than a dozen years have passed after the death of Joan Crawford, but the name of this woman is still a symbol of the actress and the woman with a capital "W". External beauty, incredible inner core, and determination allowed her to stand on a par with such legends of cinema as Marlene Dietrich and Greta Garbo. 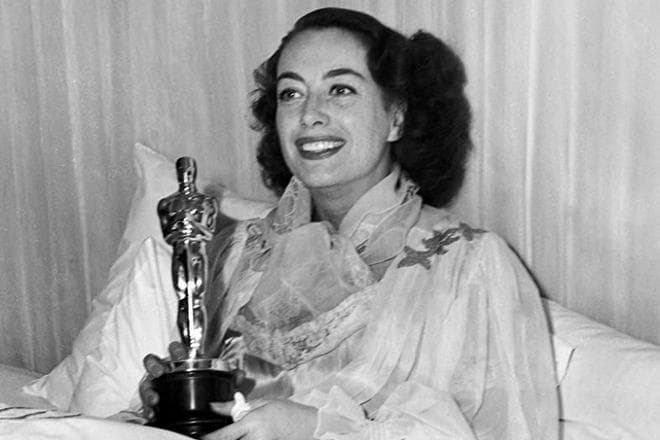 The remarkable acting talent brought Joan an Oscar and the love of the audience, which remains with her. The biography of Joan Crawford, as the story of a true woman, is filled with mysteries. In her youth, the actress changed her official name by choosing a stage name. 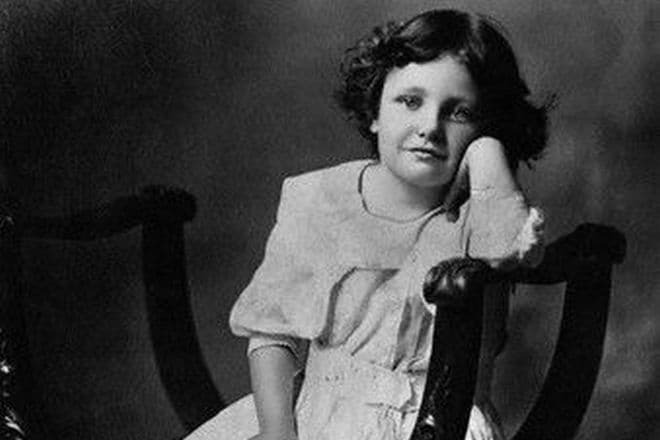 In fact, the real name of the actress was Lucille Fay LeSueur. The exact year of Joan's birth remains unknown - the official date is 1904-but some sources insist on a later date. Probably, the actress did not always reveal her actual age, which later became the source of speculation and inaccuracy. The childhood of the actress cannot be called cloudless: the parents of little Lucille broke up before the birth of her daughter (in another version — immediately after she was born). One way or another, the mother of the future star was left alone with three children (the girl had an older brother and a sister). Fortunately, the woman soon met a man who was not afraid of committing to becoming a father of three children. It was this man, Henry J. Cassin, who instilled the love for the stage and acting in Lucille. The thing is, the girl's stepfather ran the Ramsey Opera House, which allowed her to spend a lot of time behind the scenes, watching the magical transformation of artists. The magic of the stage fascinated the girl, and soon she began to dance. However, the career of a dancer was not meant to be: when the children grew up, their mother and Henry J. Cassin filed for divorce. There was no money to pay for the dancing classes, and Lucille had to earn extra money to help the family make both ends meet. She had to forget about dancing. Later, the girl enrolled at College after all. In the morning she regularly attended classes, and in the evenings took up any work. However, it was impossible to keep up this lifestyle, and soon Lucille abandoned her studies completely. Despite the fact that the future star had to work as a seller and dishwasher, the dream of the stage still glowed in her heart. The girl did not miss a single contest for aspiring actors and danced in a local café at the same time. It was there where producer Jacob J. Shubert noticed Lucille Crawford (she introduced herself as such at the time). 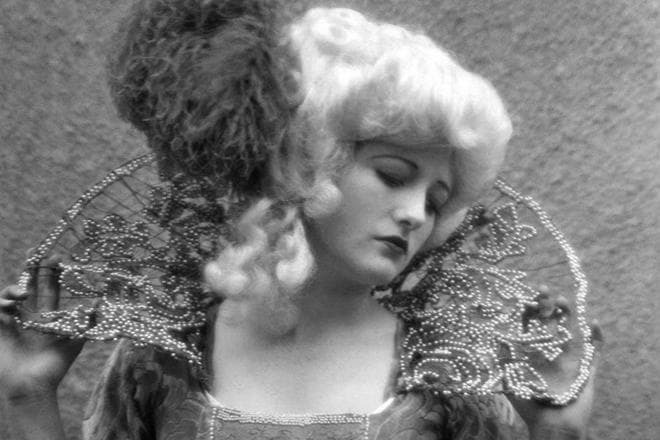 Soon Lucille already appeared on the stage of one of the Broadway theaters, and in 1925 managed to get her first role in Hollywood. It was in the film Pretty Ladies where the girl made her debut already as Joan Crawford, changing her name completely at the insistence of producers. 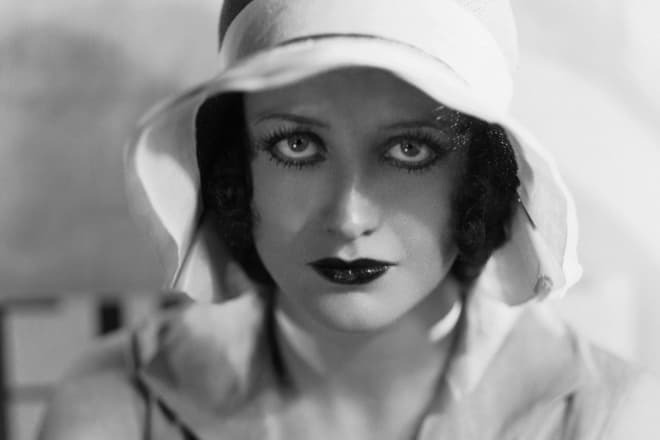 At the same time she made it to the list of aspiring actresses, and soon the name Joan Crawford appeared in the opening titles of the films Tramp, Tramp, Tramp, directed by Harry Edwards, The Unknown created by Tod Browning, and Our Dancing Daughters. Joan's filmography was gradually replenished with new roles, and the real fame came to Crawford with the passing of the silent film era. The introduction of voices in films ruined the careers of many actors of the time, but it was a triumph for Joan: the expressive, emotional voice of the actress was a great addition to her acting skills. The debut voiced motion picture for the actress was the movie Untamed where she even sang a few songs. The 1930s are considered to be the heyday of Joan's career. During that time, such films as The Stolen Jools (the incredible Buster Keaton and Norma Shearer became Joan's partners on the set), Grand Hotel directed by Edmund Goulding, Love on the Run. 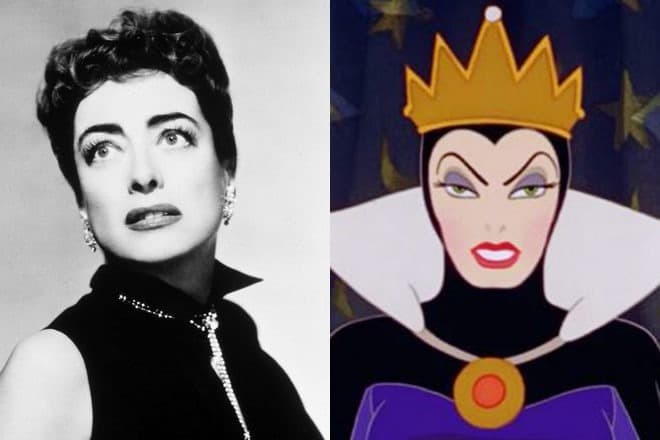 In 1937, the actress became the prototype of the image of the evil Queen in the cartoon Snow White and the Seven Dwarfs. However, the beginning of the 1940s was a time of a dry spell in the career of the actress. Nevertheless, in 1945 Joan Crawford played in the film Mildred Pierce. This role earned her an Oscar, as well as numerous invitations from directors. In the future of the actress, she would be nominated for the most famous American film awards twice, but, unfortunately, without winning the actual prize. 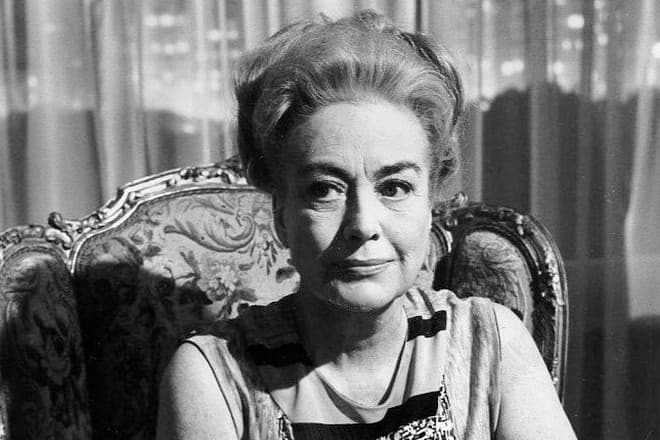 Crawford's last major work was the film What Ever Happened to Baby Jane? released in 1962. There the star played together with Bette Davis, her longtime enemy. Despite the years of hostility, both actresses showed professionalism and did not allow personal hatred to affect the filming process. The film was a real success, in a short time breaking box office records. 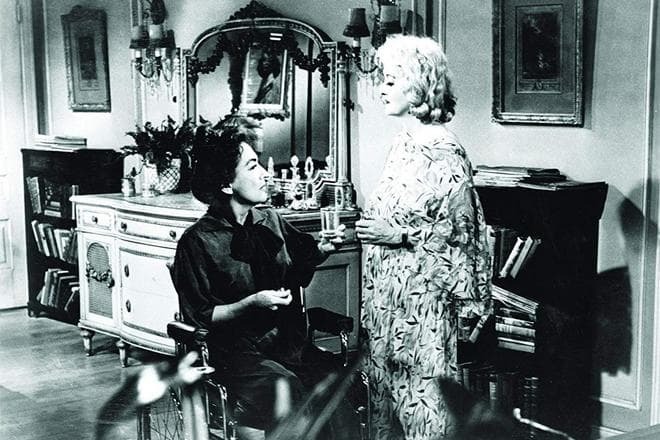 Joan Crawford and Bette Davis in the movie What Ever Happened to Baby Jane? She kept her promise and began to lead a solitary life. The personal life of Joan Crawford repeatedly became a topic for gossip and speculation. She was said to have had romantic relationships with actors and musicians and even a brief affair with Marilyn Monroe. However, this remained to be just assumptions of fans and journalists. The first beloved of the Hollywood beauty was a trumpeter, Ray Sterling. According to rumors, he was the one who supported Joan when she took her first steps on the path to glory. 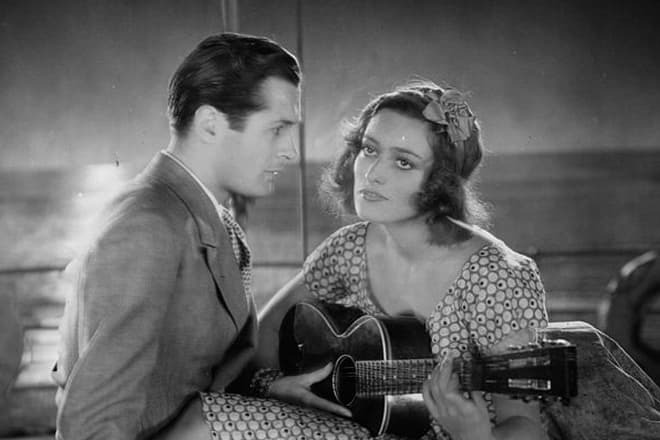 However, this relationship was short-lived, and in 1924, Joan Crawford married musician James Welton. This marriage, like many things in the biography of the actress, remained a mystery-she never mentioned it, so it is impossible to say with certainty whether it was an official marriage. In 1929, Douglas Fairbanks, Jr. became Joan's husband. At first, the relationship seemed cloudless, but in 1933 the couple broke up. 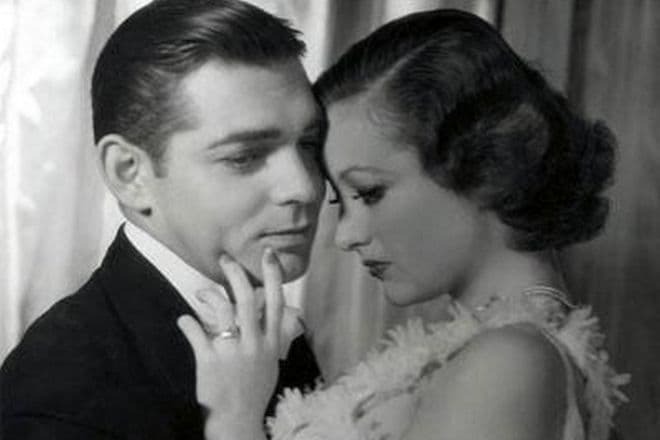 The reason for the divorce was a new love of Crawford, which was Clark Gable. This love affair was also short-lived, two years later, the actress married Franchot Tone, and in 1942 again went down the aisle with Phillip Terry. 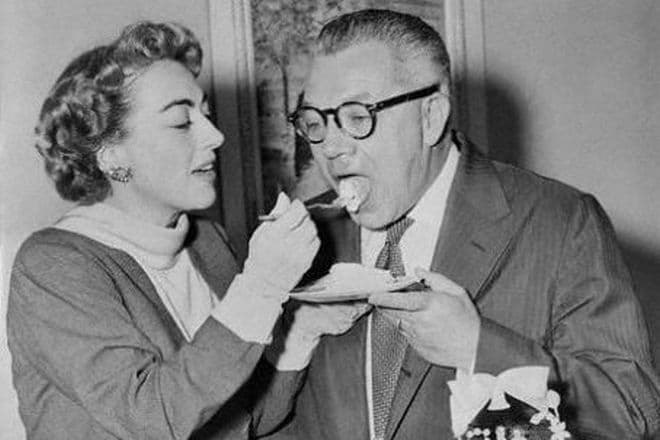 Both men, like Joan herself, were in movies. But the next lover of the Hollywood star was a man far from the film industry, Alfred Steele, the vice president of marketing of PepsiCo. With this man, Joan lived for three years, until his death. The actress had no children of her own, but the woman brought up three adopted daughters and a son. In her old age, Joan Crawford led a solitary life. It is also known that the woman struggled with pancreatic cancer for years. The actress died on May 10, 1977. The cause of death was a heart attack. 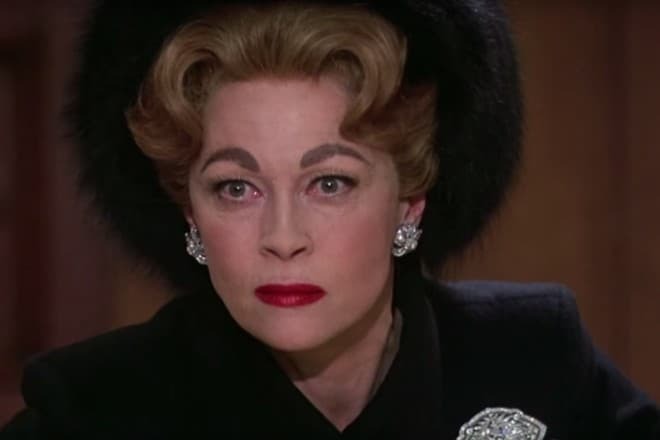 The scandals and intrigues around the name of Joan Crawford did not cease after her death: the issue was that the woman included only two adopted daughters in her will, but she left the eldest daughter Christina and her son nothing. The rest of her capital the actress gave to charity. A year and a half later, Christina released a book called Mommie Dearest, in which she tried to create a very unsightly image of the celebrity. The work also caused juicy gossip and in a short time became a bestseller. Later a film adaptation of the book was released, the leading role in which went to Faye Dunaway. Besides, at different times there appeared documentaries on the life and work of the great actress Joan Crawford.